Next-generation Mercedes-Benz SL showing more of its SLS-like front fascia with a flat nose and long bonnet. 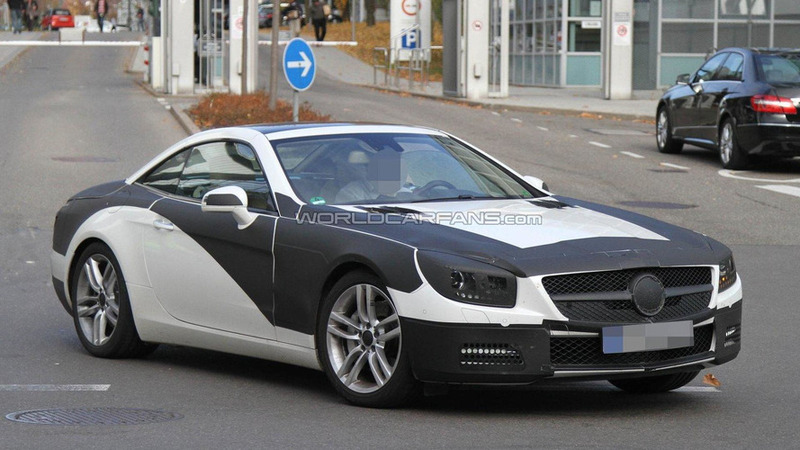 Here are the latest spy shots of the 2012 Mercedes-Benz SL-Class, now showing more of itself as we get closer to its launch date. With these shots we get a better idea of what the next-generation SL's design will be like, including that SLS-like front end with a flat nose and long bonnet as well as a new rear fascia with the LED tail lamps and the dual-exhaust. Expected to power the next Mercedes SL-Class is a series of engines that include the 3.5-liter V6 with 306 PS (225 kW / 302 hp) and 368 Nm (272 lb-ft) of torque as well as a twin-turbo 4.6-liter V8 that features 435 PS (320 kW / 429 hp) and 700 Nm (516 lb-ft). The 2012 Mercedes SL-Class will debut sometime early next year.